before we start taking about OneToMany using JPA , would like to cover the question what is OnetoMany Relationship in Hibernate. Bidirectional : Both Way Directional. 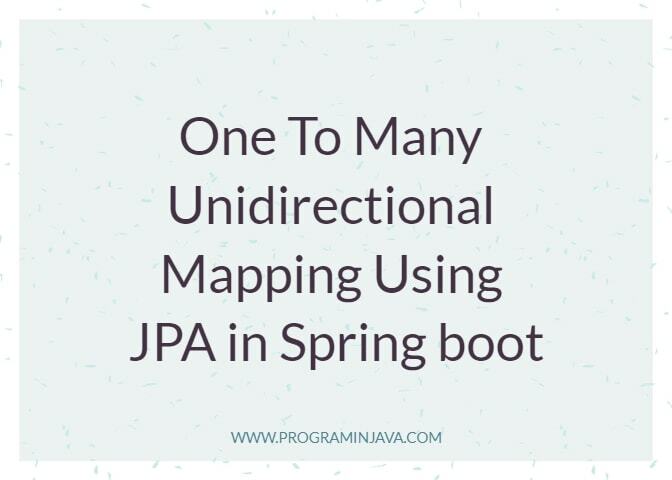 In this article we will see how we implement One To Many Mapping Unidirectional with JPA in Spring Boot. First we will discuss the Scenario then we will talk about the Solution. In this use case ratings itself dont have any importance if there is no vendor associated with it , that means if we are deleting the vendors , ratings should also be deleted associated to particular vendor. this is called as one to many unidirectional mapping. We will have one Rest End point where we are saving the vendor along with the rating of the vendor. If we see the Database schema generated for the above entity. Now we will see the service Impl Class. "comment": "the vendor is ok ok "
The Rating table don't have any vendor_id column defination ( if you have checked ). If Vendor is deleted , the ratings of the vendor will also be deleted from the table. We can fetch the rating wrt vendor but we can't fetch the vendor wrt rating as it is Unidirectional Mapping. 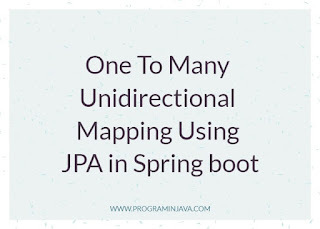 I hope this article will help you in understanding OneToMany relationship in hibernate using spring boot and JPA.